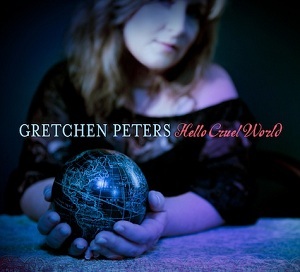 "Hello cruel world" is the ninth album from American Grammy nominated singer/songwriter Gretchen Peters. Her songs have been performed by artists including Etta James and Neil Diamond. Gretchen Peters sings what is probably best called Folk music. Her songs are simply arranged leaving her voice and the beautiful lyrics she writes as the main focus. In this way, all the emotion in the songs comes through clearly. Gretchen Peters says about the album, "After I'd finished recording Hello Cruel World, certain themes began to emerge… One is the idea that ‘survival is triumph,’ and that the real heroes are the ones who endure. That theme surprised me,” she continues. “The others have to do with religion and God, and the nature of art.” “Woman On the Wheel” and “The Matador” both explore the latter. “Art is like a jealous lover who keeps demanding you prove your devotion,” Peters says. In both of those songs the jealousy runs deep as it satisfies needs of the heart — bloodlust, desire, fear — that are typically kept hid. “St. Francis,” “Paradise Found” and other tracks, including her duet with Rodney Crowell, “Dark Angel,” are reflections on spirituality. "Dark Angel" stands out on the album as the only song to be performed as a duet. Gretchen Peters is joined by Rodney Crowell for this song. Ironically, Crowell, an ordained minister, plays the role of the dark angel in the song’s title. I love the way the two voices contrast and combine. This really is a great album, and one that stands up well to repeated listening. The thoughtful lyrics and simple but well crafted music work perfectly together to make a great album.